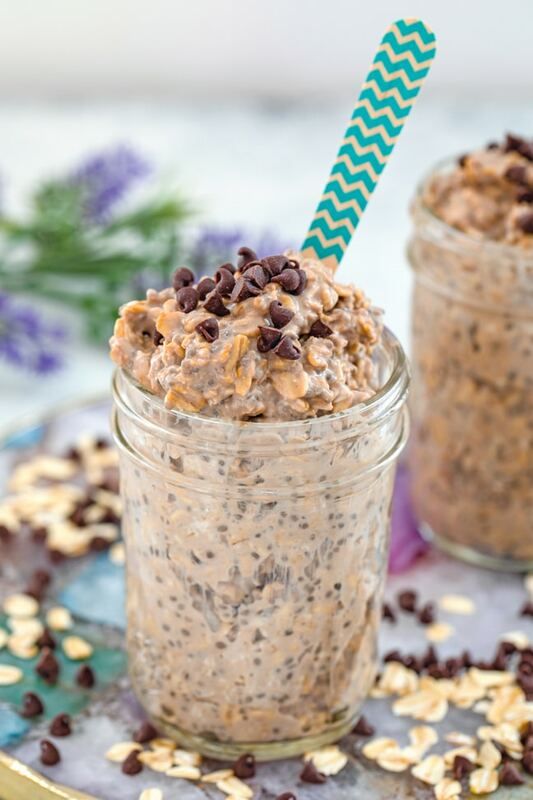 These Mocha Overnight Oats let you start your day off with a little bit of chocolate and a little bit of coffee and will keep you satisfied all morning long! Hello, Monday. If you were out late partying for St. Patrick’s Day last night, then you’re probably extra tired today. As if Mondays weren’t tough enough! I wasn’t out late partying (just out late eating corned beef), but I still feel like I need a lot of coffee today. And a super satisfying breakfast. Which is exactly why I’m combining the two into these mocha overnight oats. Don’t worry… I’m still drinking a nice large cup (or 3) of coffee on the side. Trust me when I say you should be starting every day with mocha-flavored breakfasts. OK fine, and old-fashioned oats and chia seeds, too (but really, chocolate and coffee trump all!). I love weekday breakfasts like these because not only do you prep them the night before, but the prep is so ridiculously easy, so you don’t feel like you’re spending half your evening in the kitchen. 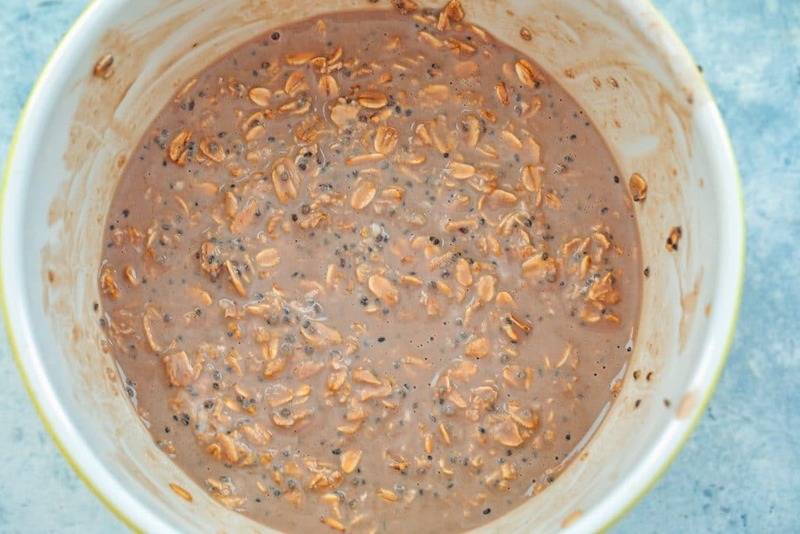 It literally takes 5 minutes maximum to get these mocha overnight oats ready! There are a couple ways you can prep your overnight oats depending on how you’re planning to serve them. “Traditionally” (I say that in quotes since overnight oats haven’t really been around long enough to carry much tradition! ), overnight oats are made and served in mason jars. 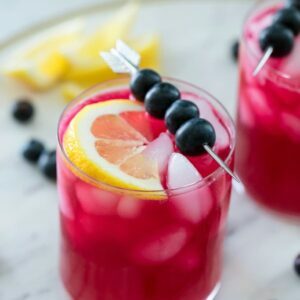 You add all the ingredients to the jar, shake them up, and then put them in the fridge to chill overnight. In the morning, you simply eat them out of the jar. Which is super convenient, especially if you want to throw them in your bag and bring them to work. 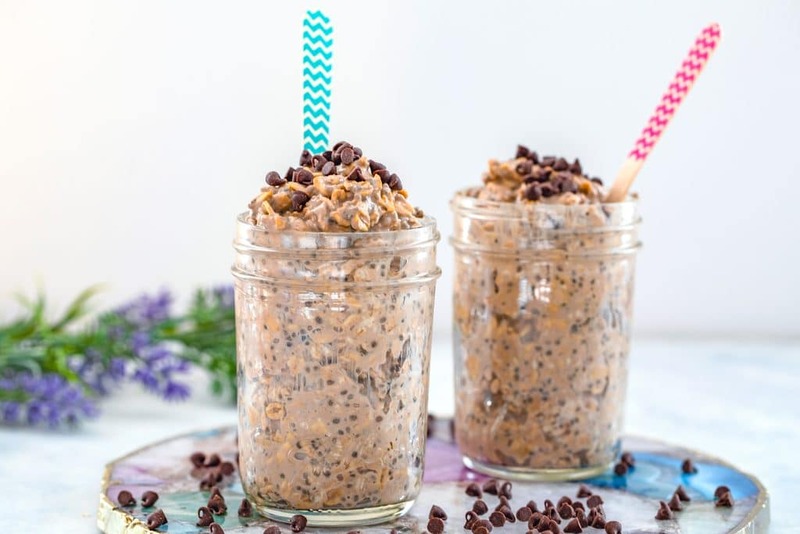 But if you don’t have mason jars or your jars aren’t large enough, you can mix all the ingredients in a big bowl, cover with plastic wrap, and then put the oats in jars or glasses in the morning. Or just eat them right out of the bowl! I wanted my oats to be overflowing out of my jars in the photos for this blog post, so I whipped my mixture up in a big bowl and scooped into my jars in the morning. By the way, the mason jars you see in my photos are 8 oz. 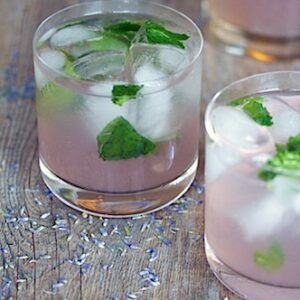 mason jars- you can purchase a set of 12 here (affiliate link). Into the bowl goes old-fashioned oats, chia seeds, 2% Greek yogurt (you can use any fat content you choose, but I almost always go for 2% since it satisfies more), chocolate soy milk (but you can use any chocolate milk or dairy alternative), brewed coffee (that’s been cooled), and 2 teaspoons of mini chocolate chips. After 8 hours in the fridge, my mixture had thickened up quite a bit and was ready for enjoying! Well, not before topping with more mini chocolate chips. I didn’t want to go too overboard with the chocolate here since it is breakfast and all… But sometimes a little bit of chocolate is exactly what you need to get you out of bed in the morning. Plus, you can excuse a little bit of chocolate for breakfast when you’re also packing in lots of healthy oats and chia seeds! That said, you can totally adjust the amount of chocolate chips used. I actually made a batch of these with no chocolate chips added at all and the oats were still delicious, but just a tad bit bland, though it will also depend on how much sugar is in your chocolate milk. 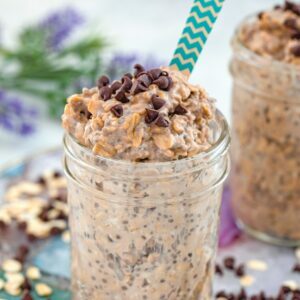 I absolutely love that you can taste the chocolate and coffee in every bite of these mocha overnight oats. So many times, things are labeled “mocha” flavored and I can’t taste the coffee at all. And let’s just say, I love my coffee and I want to taste it. And my chocolate, too. Which is why mocha is basically the best flavor in all the world. Even better when it’s for breakfast. Annnd even better when that breakfast is so ridiculously easy to make. I’m telling you, 5 minutes at night and this breakfast can be yours in the morning! Just make sure you save a little leftover coffee in that pot. I know… that’s probably asking too much, right? Luckily, I have a Keurig so if I forget to save coffee, I just make another cup later in the day. I definitely go through phases when it comes to making overnight oats, but every time I do, I tell myself I need to make them more often. They’re so easy and ridiculously satisfying… Especially this chocolate/coffee version! 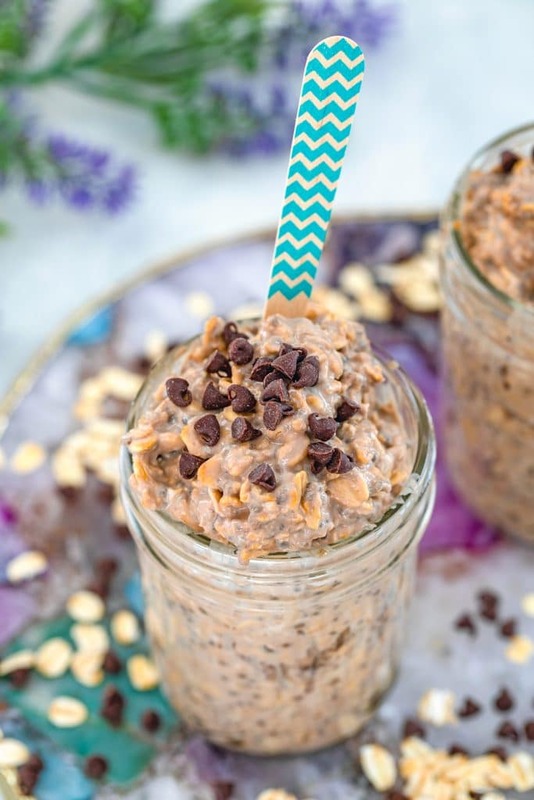 When I eat these mocha overnight oats in the morning, I feel full all morning long when on a typical morning, I’m hungry pretty much every hour. Do you ever make overnight oats? If you’re looking for more quick and easy healthy breakfasts, check out my Coconut Chia Dragon Fruit Smoothie Jars and my Bircher Muesli. And if it’s the holiday season, you NEED to make my Eggnog Overnight Oats! I’m also in love with these Fig and Quinoa Overnight Oats from The Cook & Him. 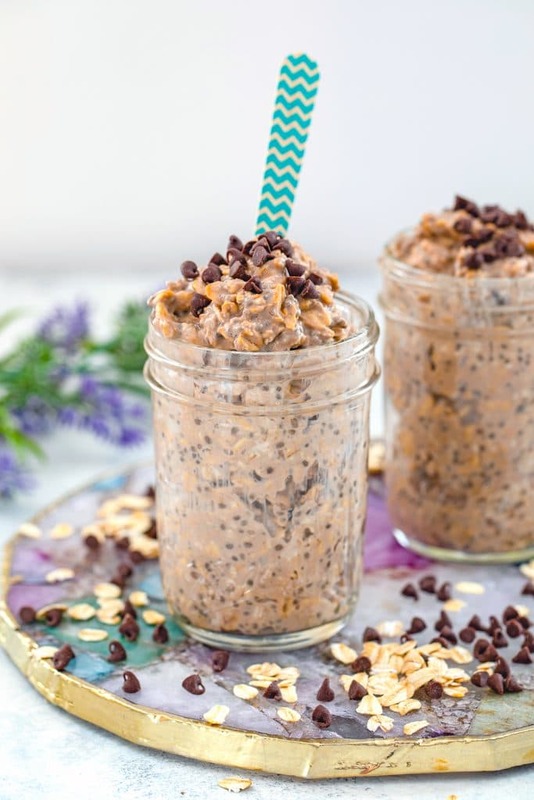 Combine old-fashioned oats, chia seeds, Greek yogurt, chocolate milk, coffee, and 2 tsp mini chocolate chips in a mason jar; cover; and shake to combine. If your jar isn't big enough, you can mix ingredients together in a bowl. Refrigerate overnight, or for at least 8 hours. Before eating, top with remaining 1 tsp mini chocolate chips. Feel free to adjust sweetness by adding more or fewer chocolate chips to mixture. 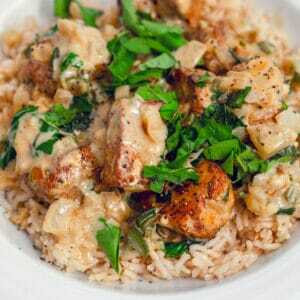 You can easily double or triple this recipe to make additional servings. Here's an affiliate link to the 8 oz. jars I used in this post. 5 Responses to "Mocha Overnight Oats"
I’ve never tried overnight oats, but this mocha flavored version looks and sounds so good! Overnight oats are our favorite breakfast during spring and summer. Love the mocha flavor here! You had me at mocha…what a fun idea for breakfast. Oooh! Loving this combination here! 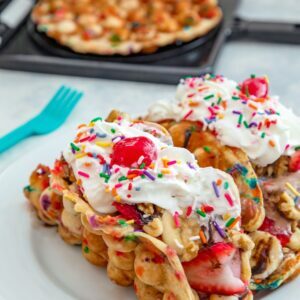 Perfect for a quick breakfast!